When I first moved upstate, I would get in my car after work and drive aimlessly letting myself get lost and explore the area. I liked the idea of not knowing where I was going, but just intuitively making a left or a right and ending up somewhere interesting. On one of these drives, I ended up in Ellenville, NY in the lower Catskills. It's a charming, but beat up little town that used to be a great hub for the famous Catskill resorts. There's a wonderful little town square w/ a statue of a boy peeing into a fountain. It's an innocent piece of public art, yet it shows a very New York sense of humor. I snapped a photo of the local church just as a thunderstorm was approaching. 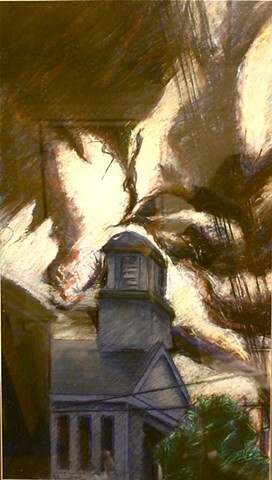 I had fun exaggerating the thunderstorm and the church steeple. There is a reflection of another framed work in the photo. At some point, I will take it out of the frame and re-photograph the image, but for now, this will have to do, sorry.